Thursday (4 Nov) there is a public lecture at COSI in Columbus you don't want to miss. The talk will be given by Dr. Richard A. Tapia -- a big name in applied mathematics, an entertaining speaker, and long-time "champion of under-represented minorities in the sciences." Tapia has received numerous professional and community service honors and awards including the annual Blackwell-Tapia Conference being named in his honor (his reason for visiting Columbus) and being inducted into the Texas Science Hall of Fame (yes, such a thing really does exist!). 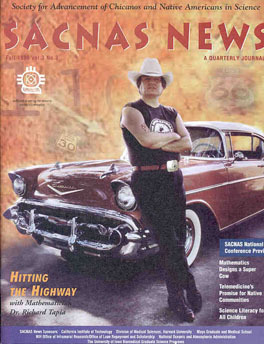 For most of his life, Richard Tapia has been involved in some aspect of drag racing. He has witnessed the birth and growth of many myths concerning dragster speed and acceleration. Some of these myths will be explained and validated in this talk, while others will be destroyed. For example, Dr. Tapia will explain why dragster acceleration can be greater than the acceleration due to gravity, an age-old inconsistency, and he will present his Fundamental Theorem of Drag Racing. Part of this talk will be a historical account of the development of drag racing and several lively videos will accompany this discussion. More about Dr. Tapia can be found here, here, and here. More on the Blackwell-Tapia Conference can be found by clicking the "Blackwell-Tapia" link on this website.